This is a trail on the western slopes of the Catalina Mountains below Samaniego Ridge. Most of these trails in this area are used as mountain bike trails but do see some hikers, especially as you get higher up on the slopes of Samaniego Ridge. There is a maze of trails in this area many of them are not official named routes. Signage in this area is nonexistent. This trail is entirely on National Forest but access is from State Trust land and a State Trust Land Permit may be required. I was informed by the locals that hiking in the area didn’t require a permit but parking on state Trust Land probably does. The rules for State Trust Land require that you get a permit if entering Trust Land. I went on line and got a year pass for $15.00 to be on the safe side. The Majority of the trails in this area are on National Forest but the Trail Heads are on Trust Land. Accessing this trail is from the Golder Ranch Road Trail Head via the Middle Gate and 50 Year Upper Trail. This trail may also be accessed indirectly from Cherry Tank Trail on the Charouleau Gap Road which is on National forest land. The Charouleau Gap Road is a rough 4WD road and in places not sure I would call it a road even for high clearance 4WD. This trail starts at the triple junction of the 50 Year Trail, the 50 Year Upper Trail and the Gem Trail. All three Trails start or end here. About 200 feet east of this junction along the 50 Year Upper Trail, the Cherry Tank Upper Trail heads northeast following along the northern most tributary of Sutherland Wash. The trail almost immediately crosses to the east side of this creek and continues to climb a small ridge before dropping back down and crossing back over to the west side of the creek. 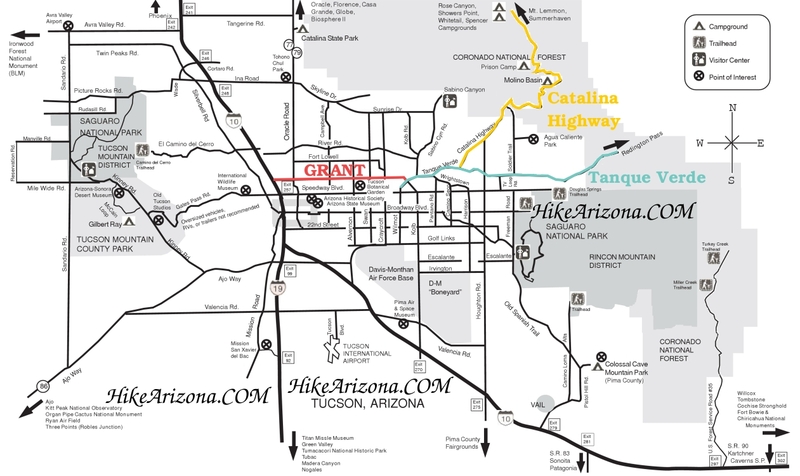 This trail is 1.6 miles long and has an elevation gain of 400 feet. The trail skirts around the north side of a granite hill with a peak of 4175 feet but stays well below the summit, it ends on the east side of this hill at about the midpoint on the Cherry Tank Trail. This trail transitions from the Sutherland Wash Drainage to the Dodge Tank Drainage which dumps directly into Canada Del Oro Wash. This trail is easy to follow with only a few areas where the trail is vague and easy to get off trail but usually quickly noticed. Much of this confusion is due to the fact that there is much more grass growing here than on the lower trails. The first and major confusion along this trail is just after passing over the first ridge and before crossing Sutherland creek the second time. Once over the ridge keep an eye open for where the trail heads due north and crosses the creek, the trail on the other side of the creek is visible and can be used as an aim point if you lose the trail. The trail continues a gradual climb and ends up on the east side of the Granite Hill 4175. Stay vigilant along the last 0.3 miles as the trail can be missed as it travels through the grass lands, also a favorite area for snakes. From here there are views to the northeast of Charouleau Gap and to the east of Samaniego Ridge and peak. This trail does not appear to be heavily used by mountain bikers. From Tucson take Hwy 77 (Oracle Road) to the town of catalina. At Golder Ranch Road turn right. Follow Golder Ranch Road until it turns to dirt, go through the cattle guard, take an immediate left on E. Equestrian Trail. follow dirt road for 0.6 miles turn right at the corral. Follow the 4wd road 0.7 miles to trail head at corral and cattle guard.